Ontario has elected a new majority government and Doug Ford is Premier Designate of Ontario. In the end, Ontario voters have voted out the Liberals and opted for a major change in government. Congratulations to Mr. Ford and his team on their election victory and a thank you to all candidates in this election who chose to run and campaign. Political life is a challenge and one cannot say enough about how important it is to have people willing to run for office and serve the public interest. In the end, any democracy is only as effective as the people who are willing to participate whether as candidates or voters. It is the day after and as of this morning the PCs hold 76 seats with 40.6 percent of the popular vote. Their share of the popular vote was in the end higher than the polls predicted. The NDP hold 40 seats with 33.7 percent of the popular vote and the Liberals are down to 7 seats with 19.3 percent of the popular vote. The Liberal collapse has reduced them to virtual islands of support - three seats in the GTA, three in Ottawa and 1 in northern Ontario. The Green Party has also managed a positive showing electing 1 – their leader – in Guelph with 4.6 percent of the vote. It is a majority government and for those concerned about uncertainty, a minority government would have created more uncertainty than a majority government. Any concerns about uncertainty with respect to policy direction are now entirely in the hands of the new elected government. With respect to northern Ontario, the region has diverse representation that includes members of the governing party as well as opposition voices to air issues and concerns. The elected PC members are also spread across the north and include Greg Rickford (Kenora-Rainy River), Vic Fedeli (Nipissing), Norm Miller (Parry Sound-Muskoka) and Ross Romano (Sault Ste. Marie). As mentioned in an earlier post, these are good and effective members of the incoming team with proven talent and the north will be well served by them. Indeed, there is also cabinet material among them. Vic Fedeli is in my opinion a leading candidate for the finance portfolio while Norm Miller and Gred Rickford would make good ministers in portfolios such as northern development, natural resources and transportation. In terms of the road ahead, the next few weeks will provide some indication of what the actual direction of the new government will be. While many have criticized the lack of specifics of the PC campaign, it should also be noted that as a campaign strategy, presenting fewer targets for criticism can also be effective. However, the campaign is over, and after the new government and cabinet is sworn in one can expect quick movement on a few high-profile platform items such as immediate lowering of the gasoline tax in order to demonstrate action on promises made. However, longer term action will require more methodical work not least of which will be a budget and direction on the province's finances. With respect to the province's finances, as a start, I would suggest an expenditure growth target of 2+1 (2% inflation and 1% population growth) which would allow provincial expenditures to grow slower than historical revenue growth rates thus bringing the budget into balance sooner rather than later. I would also urge the establishment of a new independent capital expenditure review process to help better assess the approval of the capital projects which have been adding to the provincial debt. I of course as always have a few other ideas and they are available here in more detailed format. I am also looking forward to how things are going to shape up also when it comes to initiatives for northern economic development. So, there you have it. The election is over and there will now be a few days in which to reflect on what has happened and why, but ultimately there is a province to run and a northern Ontario economy to build. We have been sent a new government and despite the slings and arrows and acrimony of any election campaign, hope is always greatest at the outset of any new government’s mandate. While there are concerns about the new government being a “wild ride”, one should always remember that as important as a party leader is, under our system of government the premier is in the end simply first among equals. Well, today is election day and as we pause and wait for the results later today, why not take another look at northern Ontario's population but this time with numbers from the 2017 BMA Municipal Study. Two items for your consideration. First, a table showing population in the major northern Ontario municipalities as well as the growth rates of their population for the period 2006 to 2011 and 2011 to 2016. The table ranks the cities from the highest to lowest growth rates for the period 2011 to 2016 and they show that at the top are Parry Sound and Greater Sudbury. Their populations have continued to expand and while their proximity to the GTA and its opportunities may be a factor it remains that proximity has not helped North Bay. Also of interest is Elliot Lake which has taken to marketing itself as a retirement community. Despite an aging population, people are not retiring to Elliot Lake in droves. With the north not really growing while Ontario's population rises, its share of Ontario's population is also declining. However, in this case it turns out that the North has plenty of company when it comes to shrinking population shares. 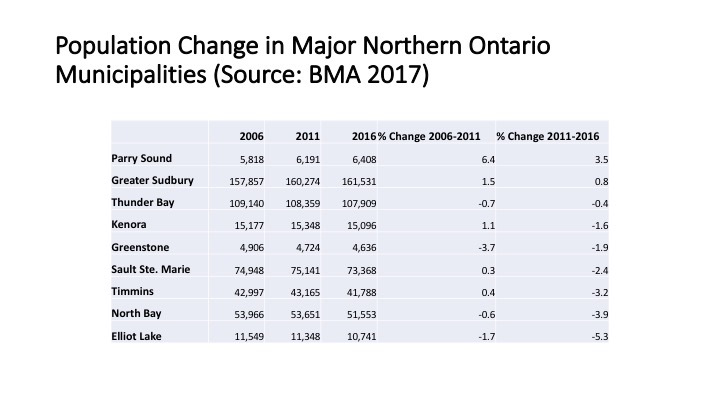 The figure below - also taken from the 2017 BMA Municipal Study (using data from the Ontario Finance Ministry) plots the population share of each of Ontario's regions since 1991 and projected to 2041. It turns out that each region is expected to decline as a share of Ontario's population by 2041 with the exception of the GTA. The GTA is projected to rise from 42% in 1991 to hit 53% by 2041. As for northern Ontario - it is going from 8 percent of the population in 1991 to 4 percent by 2041. At present it is about 7 percent. Two things. First, Ontario is becoming increasingly lopsided in terms of population and employment with the GTA enjoying a perpetual boom and the rest of the province with perhaps the exception of the Ottawa area undergoing a slow stagnation. This will be a major challenge for the next government when it comes to dealing with the provincial economy. Second, as many of you are aware, there was an increase in riding numbers for today's elections - there are now 124 seats in the legislature up for grabs. Of those, 13 are in northern Ontario which means that 10 percent of the election ridings are in the north but only about 7 percent of the population. Whatever northerners may think about their relative alienation and neglect by the south, it remains that their votes yield clout out of proportion to their population numbers. Northern Ontario needs to make use of this influence while it still retains it. It is unlikely that 2041 will see the north with 10 percent of the seats in the legislature but only 4 percent of the population. With a few days left before the June 7th provincial election, northern Ontario voters face important choices and consequences. The governing Liberals appear headed for defeat if one is to believe the evolving poll trackers. Indeed, Premier Wynne has acknowledged the election is lost. This means that come June 8th there will be a new government with consequences for the region in terms of public policy. Public policy is of importance to the region given government’s role in health, education and transportation, the dependence of the region on government employment for economic sustenance and the stalled regional economy, which has seen little net employment growth compared to the rest of the province. The Liberals have been in power since 2003 and their tenure encompasses the forest sector crisis and the stalled Ring of Fire. On the one hand, the forest sector crisis was a function of a rising Canadian dollar, aging private pulp mills and increased competition from abroad. On the other hand, the increase in electricity rates did not help. As for the Ring of Fire, in the end it is not going anywhere until chromite prices rise no matter how much is spent on infrastructure. The Liberal government’s short-term response to northern development was increased government spending in the region via assorted projects and initiatives including highway work. The long-term response was the 25-year northern Ontario growth plan – which it must be noted actually predates the Wynne government. Interestingly enough, to date the growth plan has not been accompanied by significant results and more to the point, there has been no mention of it during the current campaign. Make of that what you wish. However, given Premier Wynne has acknowledged the election is lost, thought must also be given to ensuring the region has some representation in any new government that is formed. The NDP has surged in the polls since the election was called and their policies in health, pharma care, education, rent control and hydro seem mainly to be extensions of what the Liberals have been campaigning on. For a region dependent on government job creation, an NDP government would be business as usual but with a more ideological bent away from market-based solutions to the region’s issues. If one wants to differentiate the two parties when it comes to northern policies, one would have to say a key difference is that the pleasant Andrea Horwath is presently more popular than Kathleen Wynne. However, when the rest of the team accompanying Horwath is examined more closely one wonders about the depth of talent available to serve in portfolios like northern development, natural resources and health not to mention finance. Most of her team seems drawn from public sector, labor union, non-profit and social activism sectors. Even the usually ubiquitous lawyers that dot politics are relatively scarce. Aside from a short–term continuation of government spending, the long-term economic benefits of an NDP government for northern Ontario are uncertain despite the claim of change for the better. Just as uncertain are what the benefits of a Doug Ford government would be for northern Ontario given the lack of a detailed and clearly articulated northern platform. Natural resource revenue sharing has been promised as well as a jump start to the Ring of Fire but as noted earlier, the price of chromite is not going anywhere soon. If the desire is simply for policy change, that would certainly be provided by a Conservative government more so than by the NDP but that change given traditional conservative values, is likely to not support the current orientation of the region towards public sector dependency. On the other hand, given that we have been subjected to activist government economic development policies for several decades, it may be time for a different approach. Moreover, whatever one might think of Doug Ford, it remains that his team would include some proven talent when it comes to northern Ontario – Greg Rickford, Norm Miller and Vic Fedeli come to mind. Further reflection should also be given to the prospect that based on the distribution of votes, poll trackers are suggesting a high probability of a Doug Ford administration. So what is a northern Ontario voter to do? Good question. Think about the region and its economy and the direction you think it should go. Think about what the benefits and cost of each party and their policies might be to you and your families and friends. Then make your decision and go vote. None of the above is really not an option. One must make a choice from the options available. On June 8th, the sun will still rise. The northern Ontario economy will still face challenges and they will need to be tackled no matter who forms the government. That is the only certainty. Well, the Statistics Canada GDP numbers are out for the first quarter of 2018 and real GDP in the first quarter of 2018 grew at 0.3 percent which down from 0.4 percent the previous quarter. Indeed a quick glance at a chart with the quarterly growth rates going back to 2013 suggests the period of more robust growth that took place in 2016 and somewhat into 2017 is winding up perhaps explaining the reluctance of the bank of Canada to raise interest rates yesterday. More to the point, expressed at an annualized rate, real GDP was up 1.3% in the first quarter. In comparison, real GDP in the United States grew 2.2%. The slower growth was driven by by a deceleration in household spending, lower exports of non-energy products and a decline in housing investment (-1.9%). The impact of changing household spending is indeed a factor in the slowdown and may be tied to the recent increase in interest rates as well as other factors such as the rise in gasoline prices and rents. According to Statistics Canada: "investment in housing fell 1.9% in the first quarter, the largest decline since the first quarter of 2009, due to a drop in ownership transfer costs (-13.5%). Lower resale activity coincided with new mortgage stress measures introduced nationwide in January...Household final consumption expenditure decelerated for a third consecutive quarter, slowing to 0.3% in the first quarter." The sustainability of an economy led by consumer spending and housing may finally be coming into question. How do things look going down the road? 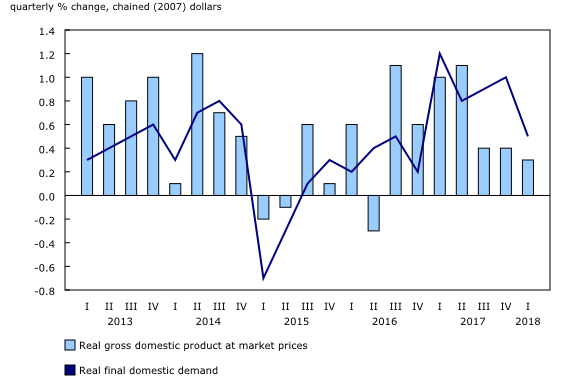 Well, FocusEconomics June 2018 Consensus Forecast still has Canada's real GDP growing at 2.2 percent annually this year with a decline to 1.9 percent in 2019 and 1.8 percent in 2020. Given an annualized growth rate of 1.3 percent in the first quarter of 2018, we have a lot of ground to make up to reach 2.2 percent.The United States meanwhile is projected at 2.8, 2.4 and 2 percent for the same years. Normally, when the United States does well so do as a result of our exports to them we but that traditional link has been under increasing stress given a more protectionist US economy. Today's news that the United States may be going ahead with tariffs on Canadian aluminum and steel will not help matters much. The 2017 edition of the BMA Municipal Study is out and there is a wealth of material here for blog posts for the next little while. It is a municipal election year so comparisons of property taxes and service levels are particularly of interest. 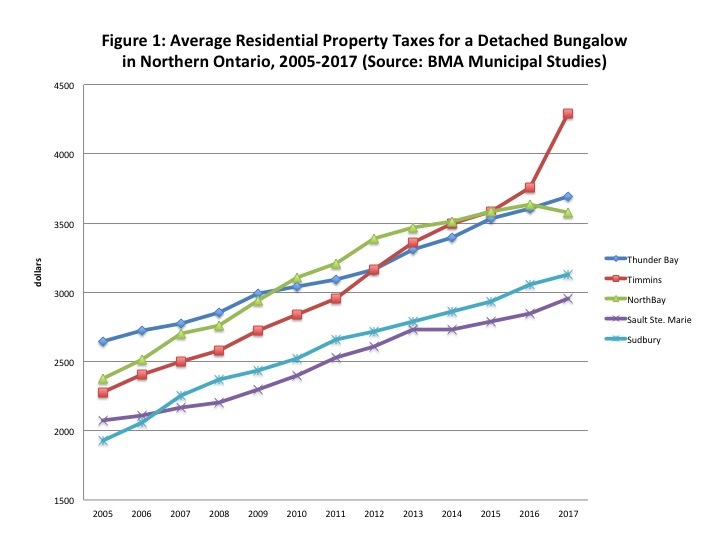 For this post, an update of property taxes paid for a detached bungalow in the five major northern Ontario cities. According to the BMA, the definition of a single detached family bungalow is: "A detached three-bedroom single story home with 1.5 bathrooms and a one car garage. Total area of the house is approximately 1200 sq, ft. and the property is situated on a lot that is approximately 5,500 sq. ft."
Figure 1 plots the average residential property tax paid for a detached bungalow for the five cities for the period 2005 to 2017. In 2005, these averaged $2,260 and by 2017 the average was $3,530 representing an increase of 56 percent. While property taxes trend up everywhere there are several features that caught my interest. 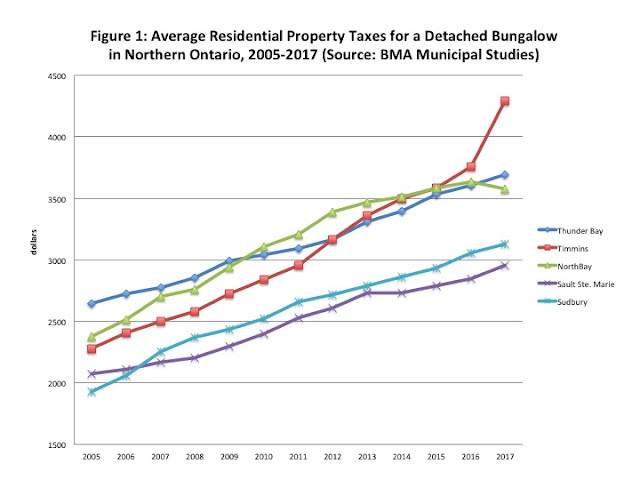 First, there is a clustering with Thunder Bay, Timmins and North Bay as higher property tax jurisdictions while Greater Sudbury and Sault Ste. Marie are generally cities with lower property tax levels - at least for this class of property. In 2017, average taxes for a detached bungalow were highest in Timmins at $4,294, followed by Thunder Bay at $3,695, then North Bay at $3,576 then Greater Sudbury at $3,123 and finally the Sault at $2,954. 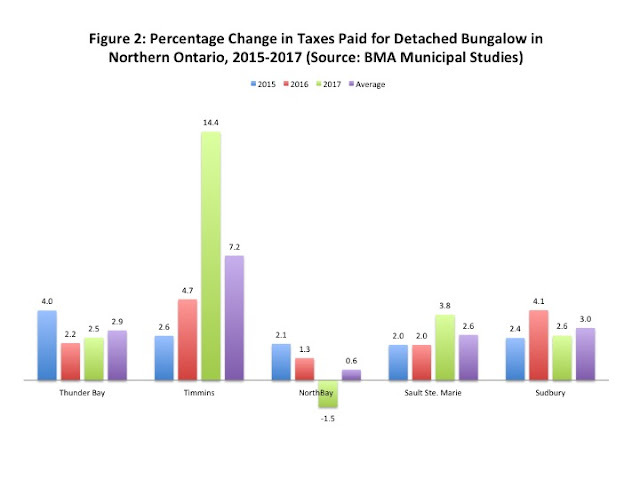 Second, the last year has seen the property taxes paid on an average detached bungalow in Timmins apparently spike while those in North Bay actually declined. Between 2016 and 2017, the value for Timmins rose from $3,574 to $4,294 - an increase of 14.4 percent. Meanwhile, in North Bay, there was a decline from $3,632 to $3,576 - a decline of 1.5 percent. Naturally, these changes need to be put into the context of the local municipal economic and fiscal environment. Keep in mind, this also does not mean every property owner in Timmins saw a 14.4 percent increase in Timmins but the steeper increases may be related to how a change in assessment values for mining companies by MPAC that turned out to be lower than expected was measured in the BMA Report. The projected decline could have resulted in higher rates on residential properties but the full impact appears to have been mitigated for the time being. It turns out the average homeowner only saw a $125 increase in 2017 in Timmins. As for North Bay, there apparently are rate decreases underway as a result of market assessment value shifts. In any event, the annual percent increases for 2015 to 2017 plus an average of the three years are plotted in Figure 2. The average increases in property taxes for a detached bungalow were highest in Timmins at 7.2 percent and lowest in North Bay at 0.6 percent. Thunder Bay was in the middle of the pack at 2.9 percent - just below Sudbury at 3 percent and ahead of the Sault at 2.6 percent. more to follow.